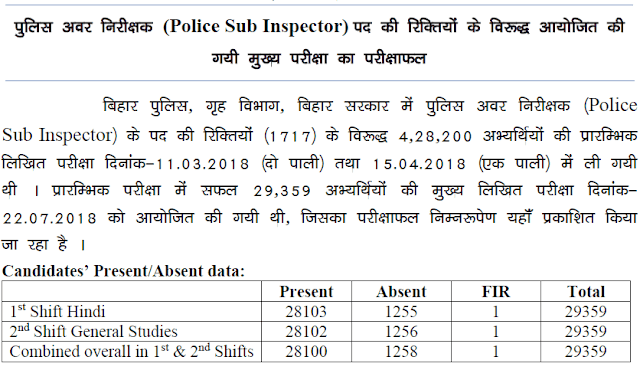 Bihar Police declared the result of Sub Inspector 2017 Exam. Candidates who appeared for the exam are expected to check the official website, bpssc.bih.nic.in, for the BPSSC results; however, the results have not yet been published on the official website. The results are expected to be published on the official BPSSC website soon. The BPPSC Police SI Main exam was conducted on July 22nd; a total of 10,161 candidates cleared the exam and are now eligible to appear for the physical test. The preliminary exam was conducted in March and April, and 29,359 candidates had qualified for the Main examination. The BPSSC had released the notification for the recruitment drive on September 16th, 2017 for 1,717 vacant police SI positions. Once selected, candidates will be sent for training before getting absorbed into the regular police force.